Microneedling increases the absorption of topical hair growth treatments by 5 TIMES or more. 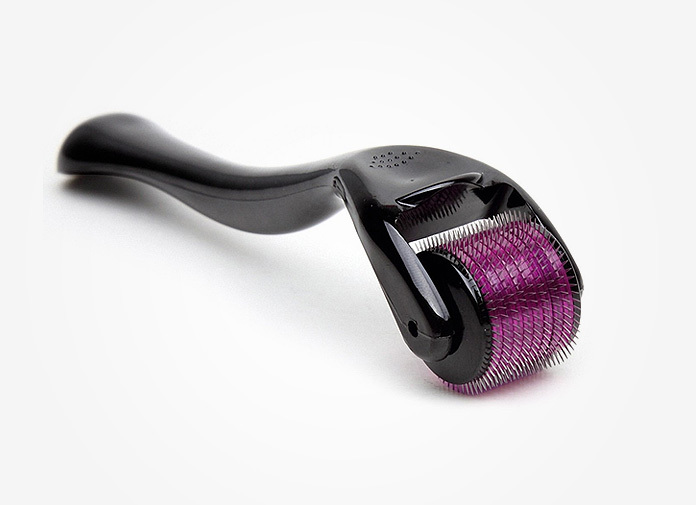 Dermaroller, also known as a Microneedle roller, has been a popular little product for various beauty routines from removing stretch marks, cellulite and acne scars, to fighting wrinkles on the face. But did you know people are also using the microneedle roller for hair growth and to reduce hair loss? There was research completed by the Department of Dermatology in Maharashtra, India claiming that the practice of microneedling helped promote hair growth in mice. The researchers also performed the experiment with 100 men who were suffering from the most common hair loss pattern for both men and women – Androgenetic Alopecia (AGA). In order to increase the accuracy of the results, the researchers randomly divided the participants into 2 groups. After 12 weeks of the study, the research team reexamined the participants’ scalps in order to find out the total number of hair strands in the affected area. 5 TIMES MORE EFFECTIVE! Group 2 (Minoxidil + Micro Needling Punctuation) noticed significant improvement in the amount of hair (Almost 5 times higher than Group 1!). Photos taken before and after the procedure also make a clear statement about the positive results from using a microneedle roller for hair growth. So what does the research indicate? In other words, microneedling therapy increased topical hair loss treatment absorption 4-5 times better than just using the topical solution alone. How to use a micro needle roller for thinning hair? According to the same research, the researchers used a 1.5 mm roller on the scalp “in longitudinal, vertical, and diagonal directions.” Basically, you need to roll it on your scalp in every direction possible. Minoxidil users: If you are currently using Minoxidil (Rogaine or other generic version), it would definitely be worthwhile using the roller to improve your results (based on the study results provided above). Essential oil for hair users: We also found out that using a micro needle roller for your hair is not a new thing. Quite a number of women are using the dermal roller with essential oils applied on the scalp (Read this article to find out how essential oils are used for reawakening the hair follicles). What is the best dermaroller for your scalp? If this is your first time, you probably want to start with a smaller size microneedle roller to see if you are comfortable using it. There are MANY different brands available on Amazon. This roller appears to be one of the popular choices. 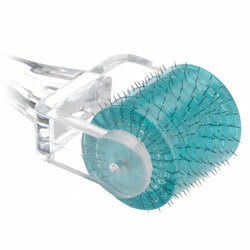 Have you used a microneedle roller along with a topical hair loss treatment? Share your experience below. Based on the research covering hair re-regrowth mentioned in the article, the research team used an 1.5 milliliter derma-roller in their study. If this is your first time trying one, the general recommendations are to start with a 0.5 millimeter version so it lightly punctures the skin with less pressure. Either way, make sure to choose one that is made from a reputable company. The derma-roller recommended in the article appears to be the most popular option as of right now. is this the only photo you have to show results from using the derma roller. This photo does not look real. I’m talking about regarding the scalp and hair growth with the derma roller. Is that possible. The questions does not add up to 44 questions like said above. Do you have more information regarding hair growth? http://www.ijtrichology.com/article.asp?issn=0974-7753;year=2013;volume=5;issue=1;spage=6;epage=11;aulast=Dhurat (This is the original source I came across -“International Journal of Trichology – Official publication of The Hair Research Society of INDIA”). Dear crowning glory, please give me some clarity. I am having lot thinning these days. I am afraid of using Minoxidil. Please tell me if you are using only derma roller or you are also using minoxidil. What is the frequency? what is the size you are using? give me clarity. Dear crowning glory, please give me clarity. I am having lot of hair thinnig these days. What is the frequebcy ? What is the size you are using? And also tell do you use it at home? No, you don’t want minox to enter your bloodstream, because it causes side effects in some people. Wait 24-48 hours (basically until the acute inflammation caused by dermarolling ends) then you can apply minox. Also if you are using other topicals I would also suggest waiting 24-48 hours for them as well because a lot are antiinflammatory (ie Castor oil). You want the skin to stay inflammed after dermarolling because that is a signal to your body to send in the necessary elements to repair your skin. Once that ends you want the topicals to come in so that your skin heals better. Also I would suggest you use a 192 pin roller instead of 512. When there are too many needles it slices the skin which can cause scarring. 1.5mm needle length is ideal. I have been using the derma roller for about a month now and do see an improvement. I use a mixture of castor oil, coco nut oil, rosemary oil instead on monox. I have experienced hair loss for the last few years, I am now 53. The roller does help with itching…when the hair was falling out it itched like a mother! I intend to keep using the above, it certainly cannot hurt. My age is 26 years. I have had hair fall for six years. In the front part of the head is baldness. Can using hair regrowth derma roller without minoxidil.